UK's only Secured By Design certified Up & Over Door. The UK's first range of Up & Over garage doors to meet the SBD accreditation. This new Guardian Range of doors have been engineered to offer even greater security to meet STS202. Currently available in the above two designs with either Retractable or Canopy gearing options and a choice of 7 standard colours. Garador's Guardian garage door range offers great looks combined with complete peace of mind for home owners. Home security is a major concern for all homeowners and the Guardian range is Secured by Design accredited having been approved by the Association of Chief Police Officers (ACPO) a UK police initiative aimed at designing out crime in products. Lock Body Protection - A reinforcing plate has been added to the lock body to prevent attacks against the locking mechanism. Anti-Snap Cylinder - A new anti-snap cylinder with a sacrificial front is included and, is designed to prevent entry even after an attack. Improved Lock Security - Additional steel plates have been added to the base corners of the door to protect the bottom locking points. High Security Bracing - There are now eight door braces, rather than two, at the back of the door for extra protection. 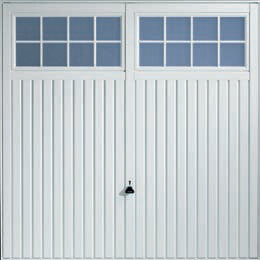 Purpose made doors available, please call Garador for further details. Guardian Range doors are not suitable for automation. For further details on gear types, please consult the Garador price list. Garador's Guardian Range of Secured by Design garage doors also qualify under the Code for Sustainable Homes. We deliver most doors on our own transport, average delivery time for this item is on a 3 - 4 week lead time. If you are ordering a specially made door or one with colour there is a possibility delivery will be slightly longer, however do not worry we will get the door to you as soon a possible.